Map Of The Country Thirty Three Miles Around The City Of New York. 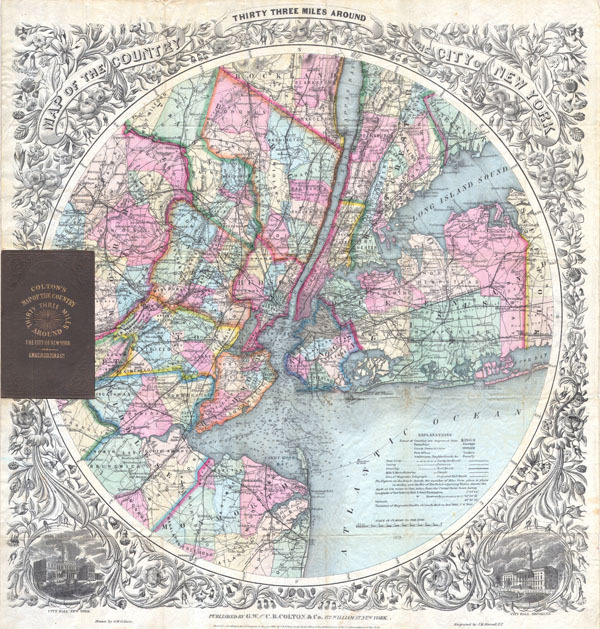 This is the extremely rare 1879 edition of one of the most beautiful pocket maps of New York made in the 19th century: Colton's Thirty Three Miles Around the City of New York. Covers New York City and vicinity as far south as Ocean County, NY, as far east as Suffolk County, as far north as Rockland County, and as far west as Somerset County. Reveals the area in considerable detail with special attention to settlements, tolls, roads, and railroads. Documents innumerable areas of interest included the New Lots in Brooklyn and a very early Central Park. New York Bay and Harbor offers numerous depth soundings taken from the 1858 U.S. Coast Survey of the region. Surrounded by a splendid decorative border with engraved views depicting 'City Hall, New York' and 'City Hall, Brooklyn.' This map was drawn and engraved by J. M Atwood based upon J. H. Eddy's 1811 map of the same name. Colton's success with this attractive map was such that it was issued in various editions for over 50 years. Haskell notes eight different editions between 1846 and 1873 and Rumsey has a variant dated 1891. We have found no references to our 1879 variant in any major collection or reference work. Folds into its original dark green linen binder. Miniature map of the city in gilt stamped on the cover. Very good. A clean and stunning copy. No discoloration or age toning. Color exceptionally stunning and vivid. Removed from but sold with original binder, which is in rough condition. Generally speaking an extraordinary copy of this rare map. Rumsey 0173.001 (1853 edition), 3472 (Eddy); Haskell, Manhattan Maps: A Co-operative List, 900-915a.